Since I wrote Gold ETFs FAQs around two years back, the gold prices have almost doubled ( Rs 28,960 per tola as on 9th Dec 2011)and every investor is trying to include gold in his portfolio. Gold Funds) instead of Physical gold? 2. Is it right time to invest in Gold ETFs or Gold Funds? 3. How do we invest in Gold ETFs or Gold Saving Funds? 4. What is the difference between Gold ETFs and Gold Saving Funds? 5. Which is a better among the two: Gold ETFs or Gold Funds? 6. Which are currently available Gold ETFs & Gold Funds in the market and what is their performance track record? 7. Which is the best Gold ETF? How to choose among the so many available Gold ETFs available in the market? Similarly, which is the best Gold Fund? Q-1:- Is it right time to invest in gold? Ans: Indeed, a very difficult question to answer. No doubt, it is the best performing asset class during last 5-10 years …during the last one year itself gold has generated returns of around 40% while equities are down by approximately 15-20%. However, first, you need to answer the basic question: Why should I invest in gold? please don’t invest just to earn big returns hoping that the spectacular performance of last one year / last 5-10 years will keep on repeating. 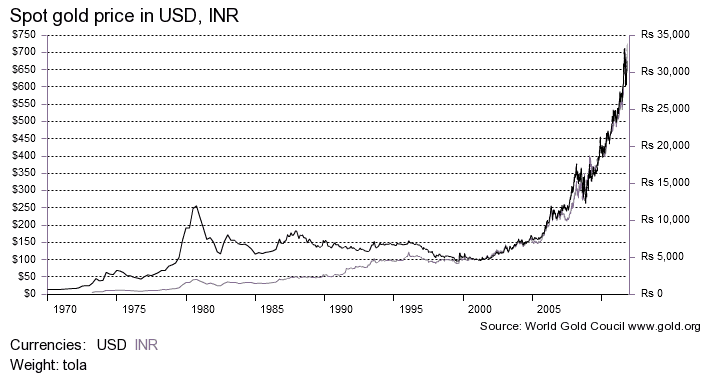 Know that gold can also move downwards or sideways for prolonged period of time as happened during 1980 to 2000. 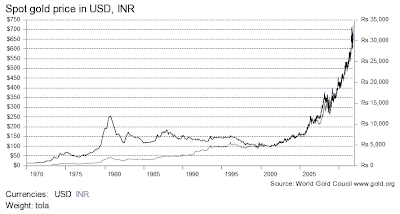 The basic idea behind investing in gold is to diversify your portfolio to reduce investment risk and not to earn those spectacular returns; if you see the graph above, notice that it is only from 2001onwards, gold has started its upward movement, but you never know when the tide will turn. So avoid greed and invest 5-10% of your portfolio and that too gradually in small proportions over a period of time. Q-2: What are Gold Saving Funds (or, Gold Funds)? How are they different from Gold ETFs? A: Gold Funds are mutual fund schemes; technically called FOF (Fund of Fund) schemes which invest in the Gold ETFs of the same mutual fund company. For example, ‘Kotak Gold’ invests entirely in the ‘Kotak Gold ETF’ and ‘Reliance Gold’ invests in ‘Reliance Gold ETF’. In simple words, putting your money in Gold Funds amounts to indirectly investing in Gold ETFs. The basic difference is that unlike Gold ETFs which can only be purchased from Stock Exchanges (NSE & BSE) through brokers & for which you require a Demat account, Gold Funds are purchased directly from the mutual fund house similar to the way you buy other mutual fund units. The objective behind launching Gold Funds is to allow investors who don’t have a Demat Account to invest in gold. Q-3: Should I Invest in Gold Funds or Gold ETFs? A: Gold ETFs score over Gold Funds since cost of investing in gold funds is much higher as compared to gold ETFs which ultimately drags down your returns. In case ‘Gold ETFs’ you pay annual charges of both the Gold Fund as well as the Gold ETF. Further you’ll have to pay exit load if you redeem before a specified period; for example, in case of Religare Gold Fund exit charges are 2% for redemption before 6 months and 1% if redeemed between 6 months & 1 year from the date of purchase. Although based on short term performance, there is not too much variation…but once these gold saving funds complete 2-3 years, you’ll notice the difference. So, if you’re having a Demat Account, invest directly in gold ETFs. On the other hand, if you don’t have a Demat Account then invest through Gold Funds because opening a Demat account only for the purpose of investing in Gold Funds (assuming no intention to invest in equities) is a costly affair keeping in view that you’ll have to bear annual maintenance charges of Demat account which usually are in the range of Rs. 250-750 per annum (in addition to brokerage & transaction charges). Q-4:OK, I’ve decided to invest in Gold ETFs instead of the Gold Funds? But how do I know which one to invest in? Should I choose any one on random basis or is there any criteria for selecting out of the 12 available Gold ETFs?Ans: Put simply, you would like to know: Are all the Gold ETFs currently available in the market performing similarly? Or, is there any best performing Gold ETFs? As on date 12 Gold ETFs are available in the market: Axis Gold ETF, Birla SunLife Gold ETF, Goldman Sachs Gold ETF, HDFC Gold ETF, ICICI Prudential Gold ETF, IDBI Gold ETF, Kotak Gold ETF, Quantum Gold, Reliance Gold ETF, Religare Gold ETF, SBI Gold ETS and UTI Gold ETF. Although, earlier I had mentioned that it doesn’t matter which one you invest in, but now when we see the track record, it comes out that it indeed matters. There is surely a way to choose the best performing Gold ETFs. Let’s first see the performance in terms of returns (as on date)— on a 3 yrs basis, there’s a meager difference between the best & the worst. Out of the 5 Gold ETFs which are more than 3 years old, while the highest returns are 31.78% (UTI Gold ETF), the lowest is 31.67% (Reliance Gold ETF)…that’s hardly a difference. However, when we see the one year performance of 10 Gold ETFs, we observe that there’s around 1% difference: Reliance Gold ETF stands top with 41.30% and ICICI Prudential Gold ETF is at the bottom with 40.33% but again on six months basis the difference again narrows down to around 0.7%. So what does it mean? The conclusion is that there’s no significant difference and you can simply overlook it. Q:5 - Does it mean I can invest in any one of Gold ETF? Or, is there any other criteria which needs to be considered in addition to the returns?Ans: As per the NSE data, among the 11 Gold ETFs traded on the NSE in the month of Oct’11, top 3 gold ETFs—GOLDBEES, KOTAKGOLD & RELGOLD contributed 90.52% of the total trading volumes during the month. Now you’ll ask: how do these trading volumes affect the performance of the Gold ETFs? See, these have nothing to do with the returns but this is one important parameter you’ll have to watch out because what is the use of buying any asset if you face difficulty / time delay’s while selling it. Technically it’s called ‘Liquidity’ and is always a prime consideration while investing in any ‘Asset Class’ including Gold ETFs. Q-6: Fisher, now can you please give us your final verdict? Ans: Ok, instead of the best, let me tell you the worst which you should avoid at any cost…BSLGOLDETF (BIRLA SUN LIFE), AXIS GOLD (AXIS), IPGETF (ICICI), QGOLDHALF (QUANTUM)—irrespective of the returns because these GOLD ETFs are either hardly traded or have very low volumes. The number of trades as on 5th Dec 2011 of AXIS GOLD ETF, BIRLA GOLD ETF, IDBI GOLD ETF, QUANTUM GOLD ETF and ICICI GOLD ETF are less than 50. On the other hand, comparative trading volume of GOLD BEES, RELIANCE GOLD ETF and KOTAKGOLD is too high. Still, if you feel I should narrow down the choice further, go for REL GOLD or KOTAK GOLD because out of the top 3 gold ETFs with good turnover, GOLD BEES lags behind REL GOLD and KOTAK GOLD in terms of short term performance; While 1-yr returns (as on 9 Dec 2011) delivered by GOLDBEES is 40.45%, the returns of REL GOLD and KOTAL GOLD are 41.30% & 41.15% respectively. To conclude: REL GOLD and KOTAK GOLD emerges as the winner. Dear Fisher, I love reading your blog. It is always informative. But when I read about e-gold, e-silver, e-lead (e-series of products from NSEL). I formed an opinion that investing in gold through spot commodity account is cheaper way of investing in gold compared to ETF. Also e-gold physical deliveries can be taken if desired unlike Gold ETF. Wish to know what is your take on that.Thanks. Thanks Fisher. Till date I was investing in GOLDBEES using SIP, now after reading your article I would switch to REL GOLD. Great article. Thanks again. Wow, this is really exhaustive information! Many thanks for sharing this!! "In case ‘Gold ETFs’ you pay annual charges of both the Gold Fund as well as the Gold ETF. "..isnt there a typo here?? Gold Funds are FOFs which invest in other funds and cost of running both the funds (here Gold Funds & Gold ETFs) is ultimately borne by the same investor. If I buy a vegetable directly from the farmer instead of a vegetable vendor, won’t it be cheaper? Thanks. The example explains it well, but still isn't there a typo? Instead of "In case ‘Gold ETFs’ you pay annual charges of both the Gold Fund as well as the Gold ETF" shouldn't it be "In case ‘Gold Funds'you pay annual charges of both the Gold Fund as well as the Gold ETF"? Thanks for the FAQ on Gold ETFs. As usual informative. Its a delight to visit your blog. I have a basic question where I see answer nowhere. Though every article says price of 1unit gold in etf is equivalent to 1 gram of Physical gold, I don't see that in real. For example today gold price in market is around 2900rs that is for physical gold price in jewellery shop for 1gram. But today the Price of SBIGETS is 3000 above. I always see atleast 100rs hike in SBI etf fund. Why this? If you consider this price difference purchasing gold coins is better. Am I right?